Bradley Beal is being touted as one of the top shooting guards of the future. Despite an uneven rookie season, Beal is poised to build on his first year. As an early lottery pick in the 2012 NBA Draft, much was expected from Bradley Beal and early comparisons were made to Ray Allen. A strong finish to the year renewed interest in the young guard and Bradley Beal cards have been among the most popular 2012-13 rookie options ever since. 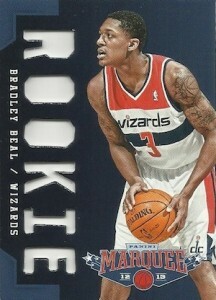 Shop for Bradley Beal cards on eBay. Bradley Beal has been on the basketball map for several years. In 2011, he was named the Gatorade National Basketball Player of the Year, joining a prestigious list that includes Kobe Bryant, LeBron James, Dwight Howard, Greg Oden, Kevin Love, Jrue Holiday and Brandon Knight. Beal decided to play college basketball at the University of Florida and was named to the SEC All-Freshman Team and First-Team All-SEC in his first year. 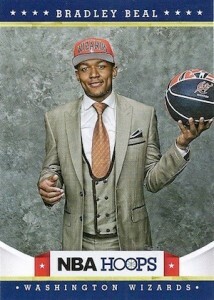 Following the one-and-done trend, he declared for the 2012 NBA Draft after his Freshman season. Widely projected to go early in the draft, Bradley Beal was taken third overall by the Washington Wizards. He joined another dynamic young player in the backcourt, starting point guard, John Wall. Due to a terrible start for the Wizards and an injury to John Wall, Beal's NBA beginnings were largely forgettable. However, he quickly started to turn it around and was named Eastern Conference Rookie of the Month for December and January. Once Wall returned, Beal was a completely different player and the Wizards were one of the better teams during the second-half of the season. A late-season injury derailed what was becoming a strong dark-horse push for NBA Rookie of the Year, but Beal still finished third overall in the ROY voting and was named to the NBA All-Rookie First Team. 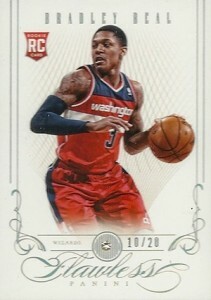 Included in the double rookie class of 2012-13 basketball products, there are plenty of Bradley Beal cards available for collectors. While his official rookie cards are only found in 2012-13 Panini products, redemptions were available in a handful of 2011-12 Panini products. Also, although they are not NBA-Licensed, 2012-13 Leaf products represent a great option to get affordable first-year Bradley Beal autographed cards. 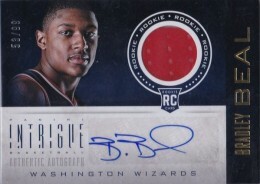 Despite being a late release on the 2012-13 basketball card release schedule, this is the most expensive Bradley Beal rookie card. It has a diamond embedded in it and is numbered to just 20 copies. The card also has an emerald-embedded parallel numbered to 5. 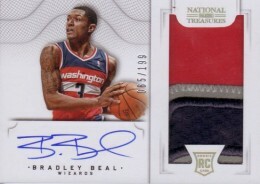 The 2012-13 Panini National Treasures Bradley Beal rookie card benefits from the pairing of an on-card autograph and massive patch swatch. Despite having a higher print run than his Panini Intrigue rookie card, this is a better choice. 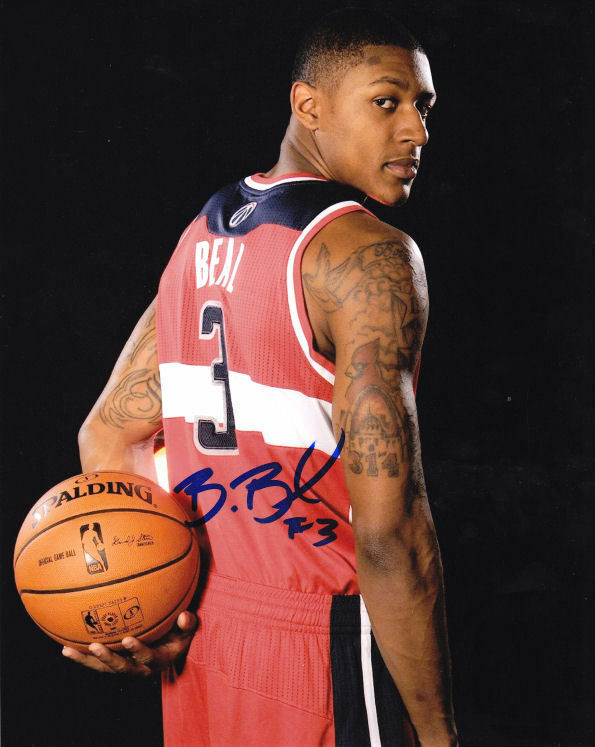 One of only a handful of autographed jersey Bradley Beal rookie cards, this one is limited to just 99 serial-numbered copies. It's not the most aesthetically pleasing card but given the material, autograph and numbering, it's a solid addition. 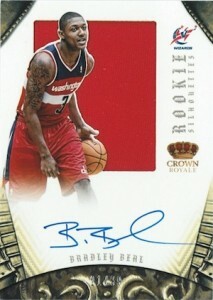 BRADLEY BEAL 2012 PANINI SELECT ROOKIE RC ON CARD AUTO AUTOGRAPH #24 149! Please note that this list will be updated as the remaining 2012-13 products are released and the number of Bradley Beal rookie cards increases. 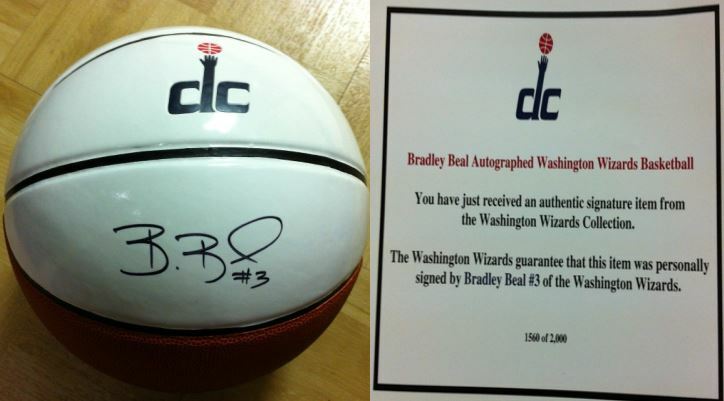 In this section, you will find examples of what an authentic Bradley Beal autograph looks like. This can be used as a first point of reference for determining the legitimacy of autograph memorabilia, but is not a substitute for having your items authenticated by a well-respected professional autograph authentication company. Reputable authentication companies include JSA, PSA and Mounted Memories to name a few. Click on any of the images below to view full size photos. The whole signature is written on a relatively level horizontal plane often rising, just slightly as the signature finishes. The entire signature consists of (3) letters: "B - B - l."
The letter "B" 's are designed to look like number "3" 's, his jersey number. The last name also includes the letter "l" which makes an oval loop.